Responding to a question on current instability in Venezuela and the presence of terrorist groups in the region, specifically Lebanese Hezbollah, U.S. Secretary of State Mike Pompeo confirmed in a recent interview that the Trump administration believes that the “Party of God,” as Hezbollah is known, maintains “active cells” in Venezuela. He went on to say that “Iranians are impacting the people of Venezuela,” because Hezbollah is trained, financed, and equipped by Tehran. Some security policy analysts seemed surprised by Pompeo’s claims, but they shouldn’t be. Hezbollah has long maintained a presence in Latin America, especially in the infamous Tri-Border Area, a semi-lawless region where Argentina, Paraguay, and Brazil converge. But even beyond the Tri-Border Area, Hezbollah is well-entrenched in Venezuela, where the Shiite terrorist group has long worked to establish a vast infrastructure for its criminal activities, including drug trafficking, money laundering, and illicit smuggling. For example, Margarita Island, located off the coast of Venezuela, is a well-known criminal hotbed where Hezbollah members have established a safe haven. 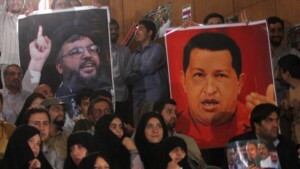 Under the regime of former Venezuelan President Hugo Chavez, the government took a more active approach to offering sanctuary to Venezuela-based supporters of Hezbollah. More controversial than what Pompeo said, however, should have been what he implied—namely, that regime change would rid Venezuela of Hezbollah. Whatever the benefits of replacing the current Venezuelan regime with Washington’s preferred alternative, there’s reason to doubt that it would change the country’s problematic relationship with the terrorist group. Hezbollah has a long and sordid history in Venezuela. A cocaine-smuggling ring active throughout the 2000s and led by a Hezbollah-linked Lebanese national named Chekry Harb, a drug trafficker and money laundering kingpin who went by the nickname “Taliban” and used Panama and Venezuela as critical hubs in an operation that sent narcotics from Colombia to the United States, West Africa, the Middle East, and Europe. Proceeds from the cocaine-trafficking ring were laundered into Colombian pesos or Venezuelan bolivars, with Hezbollah netting between 8 and 14 percent of profits. Hezbollah’s reliance on sympathizers within its diaspora communities, including in Venezuela, has significantly minimized the group’s potential exposure to detection. Venezuela’s border security officials and law enforcement, amid the country’s general desperation, have been largely unwilling to resist bribes and kickback schemes offered by Hezbollah members and their cadres. Given the present instability in Venezuela, it’s fair to wonder what would happen with Hezbollah under a government led by opposition leader Juan Guaidó, who was recently recognized as the legitimate ruler of the country by the United States and dozens of other nations, including European heavyweights France, the United Kingdom, Germany, and Spain. A government led by Guaidó would almost certainly be more active in opposing Hezbollah’s presence on Venezuelan soil, not just nominally but in more aggressively seeking to curtail the group’s criminal network and, by extension, the influence of Iran. As part of a quid pro quo for its support, Washington would likely seek to lean on Guaidó to crack down on any Iran-linked activities throughout the region. But there is a major difference between will and capability. And while a Guaidó-led government might initially demonstrate strong political will in countering Hezbollah and Iran—at least to appease the Trump administration—Venezuela as a country faces an immense challenge in attempting to rebuild its shattered society. Pushing back against Hezbollah may simply fall much lower on the list of priorities for Guaidó and his administration than the United States might like. The uncertain nature of Venezuela’s security services and military suggests a serious capability gap to contend with when working with Caracas. Venezuela has maintained close links to Russia militarily, and it remains unknown what portion of the security services are or will remain loyal to Maduro. The United States experienced great success with Plan Colombia, a multiyear, multibillion-dollar effort to engage in security cooperation with and build the capacity of Colombian law enforcement and military forces. But replicating the success of Plan Colombia, which helped the Colombian armed forces gain a significant advantage over the FARC, has proven elusive in other contexts, including in Mexico, where the Mérida Initiative, a security cooperation agreement between the United States and Mexico focused on counter-narcotics, failed to successfully combat drug trafficking and organized criminal networks in that country. During his first two years in office, President Donald Trump has demonstrated a desire to extricate the United States from costly overseas interventions. This is just one of several reasons why a “Plan Venezuela” aimed at helping that country rebuild critical government institutions may be unfeasible. To be successful, such a strategy would require a multiyear commitment of U.S. trainers (troops, contractors, or a mixture of the two) to work with Venezuelan authorities to counter the unique threat posed by Hezbollah, a group that combines terrorist and criminal activities to great effect. Another challenge is the baseline capability of the Venezuelan military and security services, certainly well below where Colombian personnel were when U.S. troops first began training them in the early 2000s. There is also the issue of Iran. Hezbollah is backed by a regime in Tehran that provides it with upward of $700 million annually, according to some estimates. Venezuela serves as Iran’s entry point into Latin America, a foothold the Iranians are unlikely to cede without putting up a fight. Moreover, Russia retains a vested interest in propping up Venezuelan President Nicolás Maduro and keeping him in power, given the longstanding relationship between the two countries. Moscow recently warned the United States against intervening in Venezuela militarily. Further, after cooperatingclosely in Syria, Hezbollah is now a known quantity to the Kremlin and an organization that President Vladimir Putin could view as an asset that, at the very least, will not interfere with Russia’s designs to extend its influence in the Western Hemisphere. If the Maduro regime is ultimately ousted from power, it will likely have a negative impact on Hezbollah in Venezuela. After all, the group’s tentacles extend into the upper reaches of Venezuela’s current government—Tareck El Aissami, the minister of industries and national production, was designated by the U.S. Treasury Department under a counter-narcotics authority and allegedly has a close relationship with Hezbollah. Yet on balance, Hezbollah has deep roots in Venezuela, and completely expelling the group—no matter how high a priority for the Trump administration—remains unlikely. The best-case scenario for Washington could be an ascendant Guaidó administration that agrees to combat Hezbollah’s influence—if the new government is willing to accept a U.S. presence in the country to begin training Venezuelan forces in the skills necessary to counter terrorism and transnational organized criminal networks with strong ties to Venezuelan society. But that scenario, of course, is dependent on the United States offering such assistance in the first place. Colin P. Clarke is a Senior Fellow at The Soufan Center and an adjunct senior political scientist at Rand Corp.